CLUE: Is It or Isn’t It? What Would the World Look Like without Academic Integrity? See below for individual event information. Energy Awareness Month is a campus-wide effort to raise awareness about energy consumption and challenge faculty, staff and students to reduce their energy usage. Last day to Drop or Withdraw, declare Pass/Not-Pass, and Change to or from Audit for First Block Classes. Each year, Americans observe National Hispanic Heritage Month from September 15-October 15, by celebrating the histories, cultures and contributions of American citizens whose ancestors came from Spain, Mexico, the Caribbean and Central and South America. The observation started in 1968 as Hispanic Heritage Week under President Lyndon Johnson and was expanded by President Ronald Reagan in 1988 to cover a 30-day period starting on September 15 and ending on October 15. It was enacted into law on August 17, 1988 on the approval of Public Law 100-402. The day of September 15 is significant because it is the anniversary of independence for Latin American countries Costa Rica, El Salvador, Guatemala, Honduras and Nicaragua. In addition, Mexico and Chile celebrate their independence days on September 16 and September 18, respectively. Also Columbus Day or Dia de la Raza, which is October 12, falls withing this 30 day period. Every year the U.S. president signs an executive order designating the month of October as National Italian American Heritage Month. Coinciding with the festivities surrounding Columbus Day, the proclamation is recognition of the many achievements, contributions, and successes of Americans of Italian descent as well as Italians in America. LGBT History Month is a month-long annual observance of lesbian, gay, bisexual and transgender history, and the history of the gay rights and related civil rights movements. It is observed during October in the United States, to include National Coming Out Day on October 11. LGBT History Month originated in the United States and was first celebrated in 1994. It was founded by Missouri high school history teacher Rodney Wilson. Spectrum and Advocates, MSU’s LGBT and Ally Alliances, along with the Office of Multicultural Programs provide a month-long series of events on campus to commemorate LGBT History Month. These include dances, panels, film screenings, fundraisers, discussions, art displays, and an annual talent show. In 1988, Congress designated each October as National Disability Employment Awareness Month (NDEAM). The Office of Disability Employment Policy has the lead in planning NDEAM activities and materials to increase the public’s awareness of the contributions and skills of American workers with disabilities. Various programs carried out throughout the month also highlight the specific employment barriers that still need to be addressed and removed. This effort to educate the American public about issues related to disability and employment actually began in 1945, when Congress enacted a law declaring the first week in October each year “National Employ the Physically Handicapped Week.” In 1962, the word “physically” was removed to acknowledge the employment needs and contributions of individuals with all types of disabilities. Bring your families, friends, pets, and walking shoes to help raise funds for AIDS awareness in Southwest Missouri. Participate in a mock hearing and help the panel determine if a violation has occurred. The Academic Integrity Council and the College of Business present a panel of business leaders to discuss ethics and the role of integrity in the business community. In this interactive, fun session, participants will discover that academic integrity is no game. Help each other determine who committed the academic integrity offense. A recent federal parolee will share his story of how his life changed forever as a result of poor ethical decisions he made professionally. A realistic discussion – in Chinese – of cultural differences experienced by Chinese students attending MSU. Free food and great prizes! 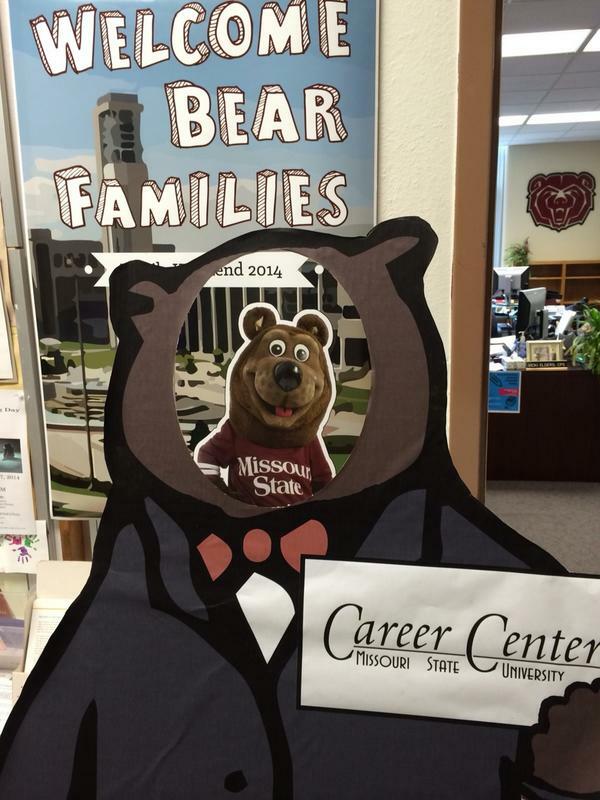 Come individually, or sign up a team before October 1 by contacting AcademicIntegrityCouncil@MissouriState.edu. The Academic Integrity Council and the College of Business bring Angela R. Morelock to the MSU community to share insights from a fraud investigator. Video and/or print contest winner presentation. Top entry will receive an iPad mini donated by PCnet. Runners up will receive gift cards donated by Commerce Bank, MSU Bookstore, and Walmart. Friday, September 26 at 7:30pm, Baker Observatory. Telescopes will be set up at Baker Observatory for people to view interesting celestial objects. We have telescopes ranging from 8 to 16 inches. Come out and watch Mars set or Uranus rise, or both. Depending on weather, we will point the telescopes at planets, binary stars, clusters of stars, nebulas, and perhaps even galaxies. Monday, September 29 at 7:30pm, Juanita K. Hammons Hall for the Performing Arts. Women’s Chorus, Men’s Chorus, Choral Union, Chorale, and Grand Chorus. This concert will feature all ensembles from Missouri State University Choral Studies. It is also free and open to the public. Thursday, September 18 – September 28 at 7:30pm, Craig Hall 207. In the days following the massacre at Columbine High School, media coverage was full of the “Who, What, Where, When and How” of this horrific event, but the question “Why?” remains.The documentary drama Columbinus explores this complex question as it weaves together courtroom testimony by survivors and witnesses; police evidence; interviews with students, parents, teachers and community members; and, most chilling of all, excerpts from the personal journals, emails and home videos of the shooters themselves. Monday, September 29 at 7pm, PSU 308 A&B. Understand your rights, learn self-defense techniques, and pinpoint important contacts. Discovery Center has utilized the plans of The Smithsonian Institution Traveling Exhibit of Green Revolution and developed Springfield’s own exhibit with recycled and re-purposed materials. Unlike most traveling exhibits, Green Revolution isn’t packed in a crate and doesn’t travel by truck, so it has virtually no carbon footprint. Wednesday, September 24 at 11:30am, PSU Information Desk. Learn about Campus LINK and get some cool giveaways. Thursday, September 25 at 11:30am, PSU Information Desk. Learn about Volunteer Programs and get some cool giveaways. 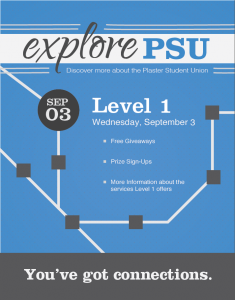 Tuesday, September 30 at 11:30am, PSU Information Desk. Learn about Event and Meeting Services and get some cool giveaways. Celebrate the start of LGBT History Awareness with your LGBTQ friends and family! Be sure to swing by and mingle with Spectrum, Advocates, Lambda Alliance, and the LGBT Resource Center. The Manhattan Short Film Festival is an instantaneous celebration that occurs simultaneously across the globe, bringing great films to great venues and allowing the audiences to select their favorites. Sponsored by the Department of Media, Journalism, and Film. Tickets are $10 at the door. Tuesday, September 30, Juanita K. Hammons Hall for the Performing Arts. The MSU Symphony Orchestra presents its fall concert. Wednesday, September 24 at 9pm, PSU Theatre. Sunday, September 28 at 9pm, PSU Theatre. Thursday, September 25 at 9pm, PSU Ballroom West. We will be bringing in a mock casino company that will set up various games that you would often play such as black jack, slot machines, craps, etc. There will be prizes given out throughout the night. Winning the games offered will correspond with chances of winning the prizes. Food and beverages will be provided, as well as music. We will also provide information on gambling addiction. Friday, September 26 at 7:30pm, PSU Level 1 Game Center. Friday, October 3 at 7:30pm, PSU Level 1 Game Center. Wednesday, October 1 at 9pm, PSU Theatre. Sunday, October 5 at 9pm, PSU Theatre. Thursday, October 2 at 9pm, Trottier Plaza Bear Head. This will be a campus wide game of capture the flag among students. Two teams will battle for victory in the darkness. Teams will be decided on site; come with friends or come alone and leave with friends. Wednesday, September 24 at 6:30pm, PSU 400. Please join us at a wonderful event to socialize and learn about African customs and culture and African American customs and culture. We will have an exciting panel of educators and students to share experiences, customs and life styles. Friday, September 26 at 4pm, PSU 313. This presentation is part of the Nigeria Public Affairs Program sponsored by the U.S. Embassy, Public Affairs Section, Abuja, Nigeria, and Missouri State University Provost Office and Division for Diversity & Inclusion. “Shattering Silences: Nigerian Cultural Connections” is a presentation by a Nigeria Scholars Delegation from the University of Nigeria, Nsukka designed to share Nigeria’s cultural diversity with Missouri State University campus and the greater community. Monday, September 29 at 1:30pm, PSU 313. This panel is part of the Nigeria Public Affairs Program sponsored by the U.S. Embassy, Public Affairs Section, Abuja, Nigeria, and Missouri State University, Provost Office and Division for Diversity & Inclusion. “Shattering Silences: International Disability Studies: Building Community” focuses on the experiences of Nigerian students with disabilities and their backgrounds, expectations, and challenges. This panel discussion is a peak into some international faculty and student perspectives and issues related to disability studies. This event is also listed on the Master Advisor calendar. Even if you are not attending this event for Master Advisor credit, please register with FCTL to attend. Food will be served at this event. Faculty and staff can register for the event through My Learning Connection. Saturday, September 27 at 9:30am, Plaster Student Union. Showcase is an open house visit day for prospective students. High school and transfer students, along with their families, are invited to attend. 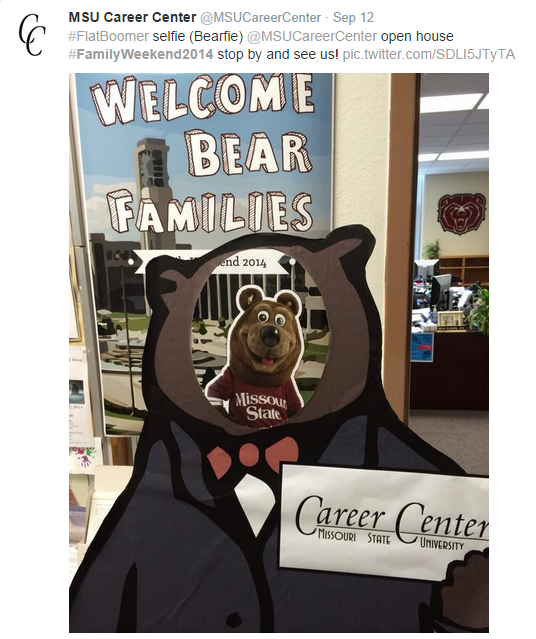 At Showcase, prospective students can meet faculty members, discover majors offered at Missouri State, take a campus tour, learn about the more than 300 student organizations, and learn about admission, financial aid, housing, Multicultural Student Services and the Honors College. Monday, September 29 at 12pm, PSU Theater. President Clif Smart and Provost Frank Einhellig will present the annual State of the University address. Friday, September 26 at 8pm, Juanita K. Hammons Hall for the Performing Arts. Saturday, September 27 at 2pm & 8pm, Juanita K. Hammons Hall for the Performing Arts. Shirley Jones and Patrick Cassidy co-star in this celebration of one of America’s favorite movie musicals. The show features gorgeous costumes, video projections, film clips, and the classic songs everyone loves! Student rush tickets available for $35 one hour prior to the performance with a valid student ID. Monday, October 6 at 7:30pm, Juanita K. Hammons Hall for the Performing Arts. The University Community Band will present a free concert on Monday, October 6 at 7:30pm in Juanita K. Hammons Hall for the Performing Arts. Missouri State University is participating as a group in the 100 Missouri Miles Challenge – Campus Challenge and we want YOU to join us in this wellness initiative. The Campus Challenge has been launched by Gov. Jay Nixon under the umbrella of the 100 Missouri Miles Challenge to encourage wellness on college campuses. School pride is on the line as we compete against other Missouri universities for the 2014 Missouri Miles Cup! It’s easy to participate. Whether it’s a stroll outside between classes or a bike ride on a trail with roommates and friends, you can register and log your miles by going to 100MissouriMiles.com. Be sure to share your experiences on Facebook and Twitter using #100MoMiles. Students, if you are going hungry, or just need something to get you through to next pay check, 3 Springfield food pantries can assist you. Visit the Food Assistance page for more information. Join Missouri State, Drury, OTC, Evangel and SBU in making a difference both locally and globally through the all collegiate shoe drive. Donating just one pair of shoes directly helps feed the hungry both in the U.S. and internationally, provides footwear goods for local vendors in developing countries, helps build water purification systems for villages in Kenya and Haiti, as well as impacts educational and healthcare needs. Shoes will be collected at sites across campus from October 1-25th. All shoes collected from each participating organization will be delivered on October 25th at 9:00am to the parking lot of Schweitzer UMC, 2747 E Sunshine Street for a rallying end to the 2014 project! Glow Zumba is back and it’s happening THIS WEDNESDAY! Take Zumba on September 24 @ 6:00pm in a blacked out studio with glow sticks to illuminate your moves. It’s a whole new twist on Zumba! It was a blast last year, so put on your neon and make this year’s a success! Experience Springfield in a whole new way with Pedal Springfield! Bring your bikes to the FRC at 6PM on Wednesday September 24 to travel the Springfield bikeways with Outdoor Adventures. The event will end at 8PM. Interested in a Climbing Expedition? Outdoor Adventures is headed to Horseshoe Canyon Ranch! This overnight climbing trip will be held from October 4th-5th and cost only $70 for everything but food! For more information check out the Outdoor Adventures page of our website or call the welcome desk at 417-836-5334. So many trips so little time! Outdoor Adventures is also planning a Current River Canoe Trip on October 9th-10th for only $60! Canoe 15 miles of this scenic river with OA. Sign up now so you don’t miss the mandatory pre-trip meeting on October 6th. Open to faculty and staff, eligible for non-credit fee waiver, $35 for members, $45 for non-members. 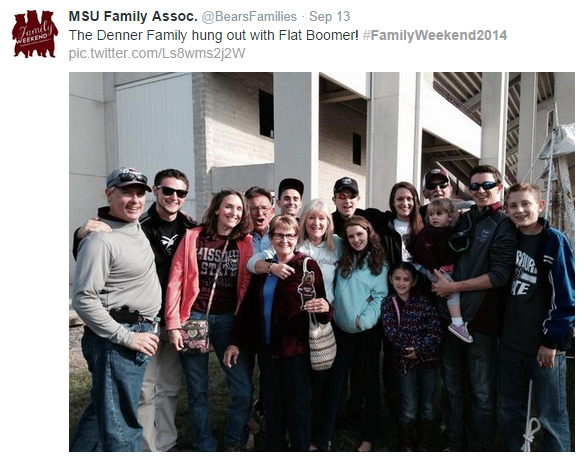 This last weekend was family weekend at Missouri State, which meant all sorts of events and things to see. Between the Showcase on Friday, the football game on Saturday, and 20% off BearWear all weekend – you can’t go wrong! 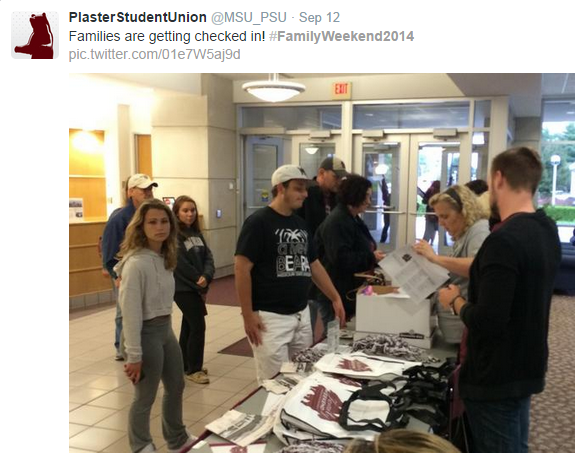 Below are tweets from Missouri State students and family about the weekend. This week’s film is United 93. This is the story of the takeoff and hijacking of United Airlines Flight 93 by terrorists, the discovery by passengers with cell phones that other hijacked planes had been steered into the World Trade Center towers, and the realization that their plane was being steered toward Washington D.C.
Greengrass takes pains to keep events believable and relatively unrhetorical, rejecting entertainment for the sake of sober reflection, though one has to ask how edifying this is apart from its reduction of the standard myths. This limitation in source material has had a peculiar effect on the script. Never is there a moment of repulsive sentimentality or exploitation, but neither is Greengrass able to realize an ultimate purpose. … for all its shock value, it is never exploitative, and it has something important to say. This semester you can enjoy a price decrease for many Level 1 games and goodies. You will now be able to enjoy billiards, table tennis, foosball, and air hockey free of charge with valid MSU ID. Whether you are between classes or you are lounging in Level 1 with friends for hours of free enjoyment, you can now also munch on FREE popcorn. 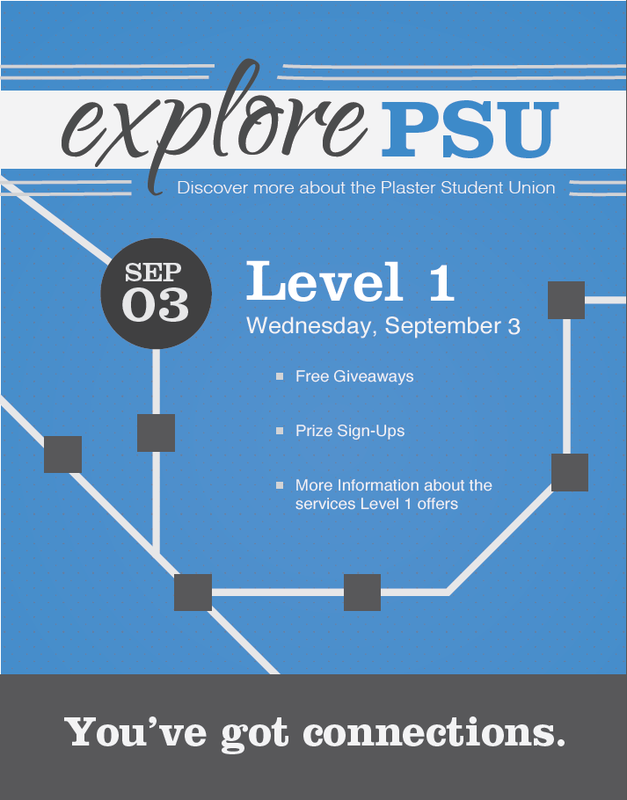 Level 1 Game Center is on the first floor of the Plaster Student Union just beyond the BearPass Office. While facing the CASL office in the first floor lobby area, take a right and follow the ramp down to the end. Level 1 is open Monday – Friday 10am – 10pm and Saturday 11am – 10pm. Level 1 is closed on Sundays, except for reservations. For more information about Level 1 Game Center or to learn how to reserve the space, please visit the Level 1 Webpage. This week’s film is Edge of Tomorrow. This is a movie about Tom Cruise working very, very hard to please the world. Why do invading extra-terrestrials always bring with them the single thing that can wipe them out? Couldn’t they have hid it on Jupiter or something?